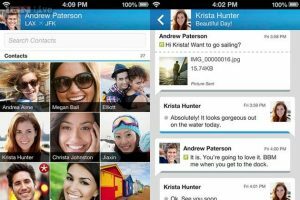 BBM has already become a popular application on iOS and Android but so far, not all of BlackBerry Messenger’s features are present on non-BlackBerry phones. Android users will now be able to enjoy at least a few of the app’s more popular features, as BlackBerry has updated BBM to include Channels and Voice Chat. The new beta of BBM for Android will allow people to join discussions with people regarding certain topics with the help of Channels, and Voice Chat enables free calls to other BBM users across all supported platforms. BlackBerry has already confirmed that these features would be coming to iOS and Android, but the Android update appears to be rolling out to beta testers sooner. Channels are already a popular feature on actual BlackBerry devices as it is similar to some of the topic feed discussions that have begun to roll out on Facebook, whereas Voice Chat is almost identical to the WiFi calling features present with Skype. Even as BlackBerry struggles to stay alive, it has apparently decided that building up its free cross-platform messaging app is worth a fair amount of time and money. For users, this is great, although BlackBerry will need to find an actual way to bring in money sometime in the near future. BBM has always been one of the best messaging apps available but without iOS or Android versions, BlackBerry users simply have not been able to use the service in all situations as it only fully with other BBM users. As of right now, the new BBM for Android is only available to registered beta testers, so anyone interested in checking out the features prior to the full release will have to sign up at the BlackBerry Beta Zone. An official release date for the Android version has not been released although it is likely that it will be coming out within the next couple of weeks as long as there are no unexpected issues with the new features. Summary: BlackBerry has released a new beta version of BBM for Android which adds support for both Video Chats and Channels. An official release date for the new version has yet to be disclosed.